GenTarget provides many “signal pathway lentivirus” for rapid, sensitive and quantitative monitoring different transduction pathway activation. These lentivirus express a luminescence or fluorescent report (firefly Luciferase, Renilla luciferase, RFP or GFP fluorescent marker) under a pathway specific promoter, or under a minimal promoter embeded multiple tandem repeats of the pathway specific transcription factor binding motif. 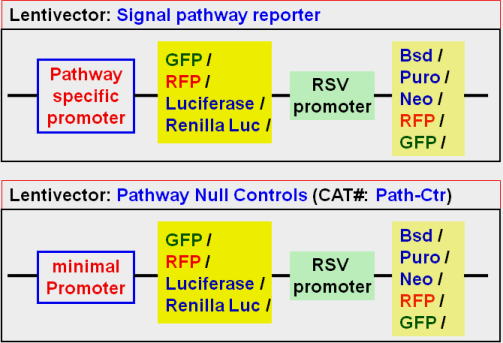 The pathway Null control lentivirus have the minimal promoter without any signal pathway specific response elements inside the promoter. These lentivirus also express an antibiotic selection marker or another fluorescent marker under a constitutive RSV promoter which provides selection tool, serves as the internal normalization control, or as the convenient monitoring method for virus transduction efficiency. See the lentivectors’ core scheme below. Those premade lentivirus products provide a high sensitive, large dynamic range and simple reporter method, by measuring the activities of a report, for performing gene regulation studies in living mammalian cells and for functional genomics and drug screening cell signaling assays. Those lentivirus can be used for generating your own pathway screening assay cell line for the cell based assay in your desired cell types.